Groundwater is one of the most important sources for drinking water, livestock water, and irrigation in Africa. It is of vital importance in meeting the Millennium Development Goals (MDGs) target of accessing clean water, as most of rural Africa and a considerable part of urban Africa are supplied by groundwater. Groundwater also has a major role to play in improving food security through expansion of irrigation supplied by shallow and deep wells. As such, groundwater has high relevance to the development and wellbeing of Africa, if adequately assessed and sustainably exploited. However, impacts of rapid development and climate change on water resources, including groundwater, are expected to be very severe unless major actions are taken to address the limited human and institutional capacity and hydrogeological knowledge base needed to devise sustainable adaptive water management strategies. Whilst the potential for groundwater resources development and the extent of their vulnerability due to climate change in the African context continue to be reported in the literature, a quantitative understanding of these issues remains poor. Although groundwater systems respond to human and climatic changes slowly (relative to surface water systems), climate change still could affect groundwater significantly through changes in groundwater recharge as well as groundwater storage and utilization. These changes result from changes in temperature and precipitation or from change in land use/land cover, and increased demand. There is therefore a need for ensuring sustainability and proper management of groundwater resources through instituting proper aquifer management practices such as the establishment of groundwater monitoring systems, better understanding of the role of groundwater storage and groundwater discharges in sustaining aquatic ecosystems, understanding the interactions between various aquifers (including transboundary aquifers) and assessing the impact of increased pumping from various aquifer systems on the sustainability of groundwater abstraction. This paper provides an overview of the regional hydrogeological framework, the current state of knowledge of aquifer systems, their development potential and climate change impacts on groundwater, research gaps, and policy implications for meeting the MDGs of accessing clean water and livelihood goals in Africa. Altchenko Y, Awulachew SB, Brida AB, Diallo HA, Mogbante D, Pavelic P, Tindimugaya C, Villholth KG. 2011. 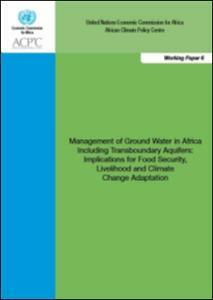 Management of groundwater in Africa including transboundary aquifers: implications for food security, livelihood and climate change adaptation. African Climate Policy Centre Working Paper 6. Addis Ababa, Ethiopia: United Nations Economic Commission for Africa (UNECA).